It was clear I had taken a wrong turn. I was on 540A and I needed to be on the 540. 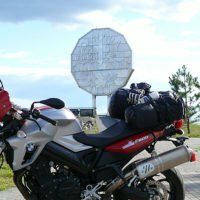 I dug into my motorcycle jacket pocket, pulled out my map and discovered I had left Manitoulin Island and was now on Barrie Island. It was that small piece of road across the water with a fast long sweeping corner after it. Back I headed. I could see three Osprey up ahead using their gigantic wingspans to soar upon the rising thermals. The sun made the water on both sides of the pavement shimmer against its cloudless blue backdrop. As the middle of the road elevated, arching up as a bridge would, I looked left and saw an osprey—we were at parallels soaring along side by side! 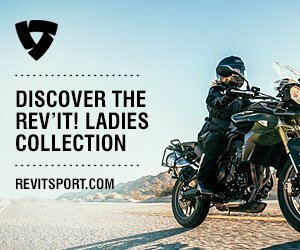 I felt airborne—what a motorcycling moment! Until now, nothing had indicated that I was on an island, let alone the world’s largest freshwater island. A hilly landscape of farm land spotted with jelly-rolled baled hay belied the ancient glacial rocks beneath it. Small herds of cattle and sheep; a real absence of people or goings-on kept me wondering if there were any inhabitants. Each time I shut the bike off on the road’s shoulder to check directions— the silence, at first overwhelming—was worth listening to. 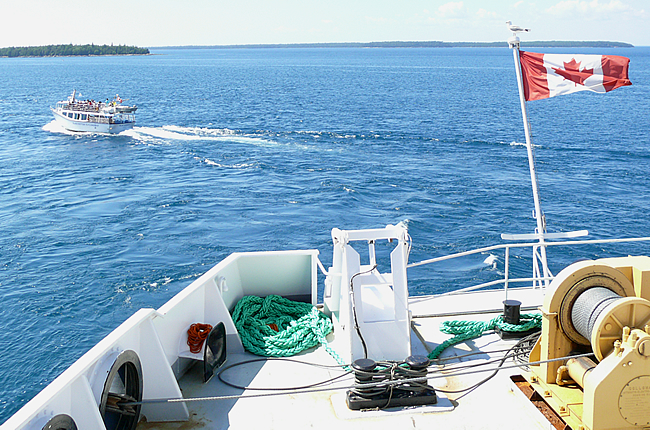 Sailing the mid-afternoon Chi-Cheemaun Ferry from Tobermory delivered me behind schedule at South Baymouth shore. 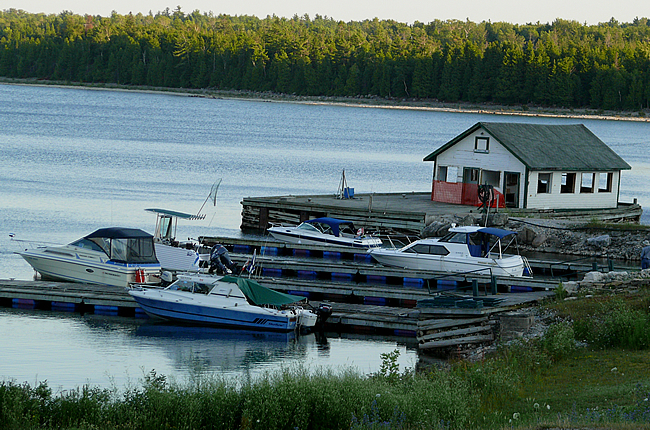 I was expected at the Meldrum Bay Inn at the furthest west of the island, about 133 kilometres. Rather than continue on the 542 North to Gore Bay, I opted for Union Road, a side road that saved me 18 kilometres. The road moved quickly beneath me; there was no traffic! Blind corners and hills intertwined with long sweeping turns kept me focused—but then it happened! I spotted a huge brown mass 300 metres ahead—a deer! Minola, 81 next year, warned me of the islands’ steep deer population. “It was the fishing which beckoned our families to the island 29 years ago,” she enthused during our chat in the Chi-Cheemaun cafeteria. I had two more deer cross my path that evening and thought how thankful I was for Minola’s wise warning! While exiting another long bend in the road, I picked up the scent of garlic! 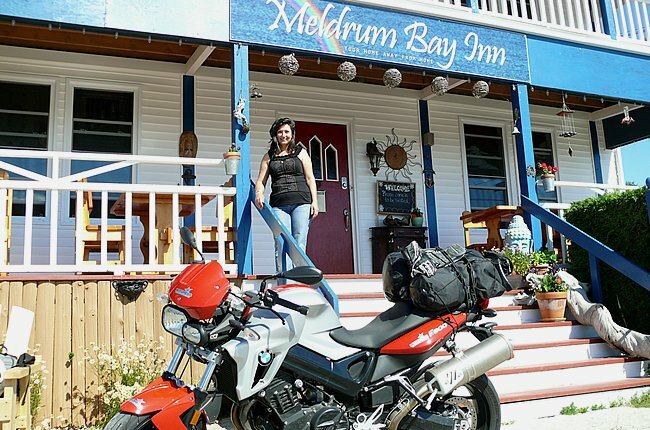 Over the next hill, there it was—the Meldrum Bay Inn and a sign stating “540 Ends.” Shirin, the owner, greeted me with a big family-like hug. She insisted that I sit down to dinner right away as it was after eight o’clock and they’d kept the kitchen open expecting my arrival. 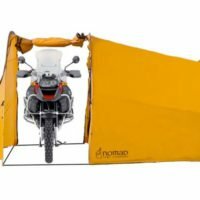 I parked the bike across the way; sprung the bungees freeing my cargo and carried it into the Inn plopping it on the sitting room floor. I sat down excusing my unbecoming “hair by helmet” and savoured the smoked trout fettuccine in a whisky Alfredo sauce—the very scent which greeted me the hillside over. With a frosty beer I settled into my dining chair on the Inn’s front porch, indulging all senses as Meldrum Bay dimmed in the lowering sun. A soft lakeside breeze brushed against the chimes hanging just above me, creating a tender hymn of tranquillity. 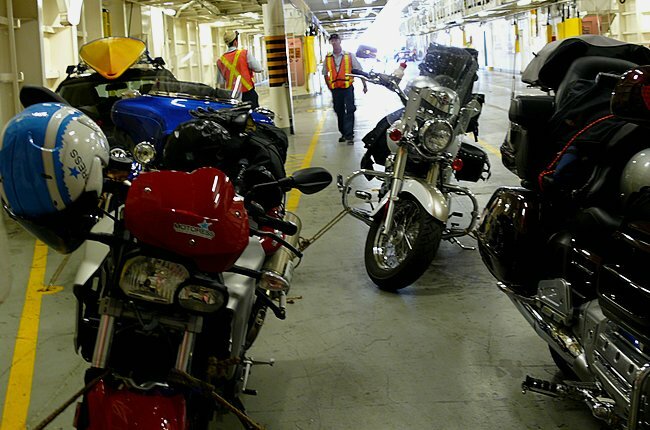 Nine hours spent on the bike—what a perfect day, I thought, and what a good night’s sleep I’m going to have! With a quick refuelling at the dockside pump, I waved a tall farewell from the disappearing road to Shirin and the new friends I’d made at the Meldrum Inn. The 540 would now take me east to Misery Bay Park and Nature Reserve located on an ancient flatbed lake bottom called an alvar! 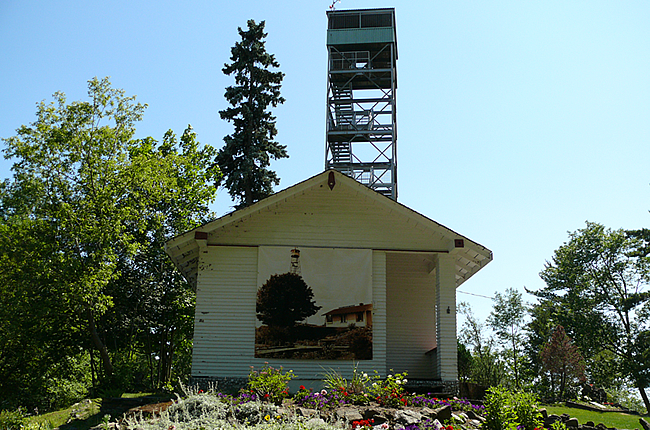 After turning onto Misery’s gravel road, I parked and walked a small path to the welcome and ‘Interpretation” centre. Welcoming volunteers pointed out the directions for one of the shorter hiking routes which took me about twenty minutes through wooded trails. The woods ended and opened up to the bay. It was decorated with large flat bits of bedrock and rocks appearing as rising turtles backs from the water below. These were the result of glaciers some 10,000 years ago. I felt no ‘misery’ as I compared my age to that of the Alvars! Back onto the 540 Eastbound still empty of traffic. The quiet enticed a group of sandhill cranes out of hiding, but then bashfully dashed into the woods as I approached. 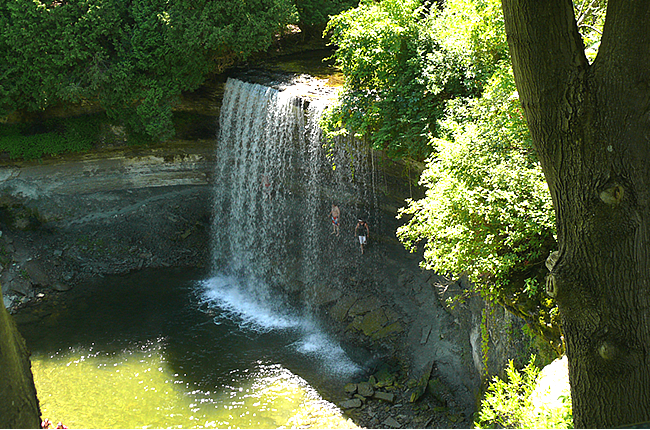 About 48 kilometres after Misery Bay, I arrived in Evansville and enjoyed viewing the Bridal Veil Falls alongside many who took a cool dip in its gorge and a photo standing behind the waters’ “veil”. I continued eastbound to M’Chigeeng First Nations, the backyard of Sheguiandah. It was in this region where archaeological discoveries confirmed Paleo-Indian and archaic cultures dating from 10,000 BCE to 2000 BCE! The Great Spirit Circle Trail Centre was along the same highway. I had the pleasure of meeting with Falcon, a representative of the association of the eight Indian nations on Manitoulin. 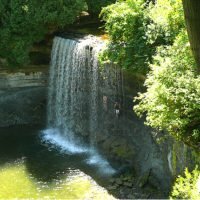 They bring authentic aboriginal experiences to enjoy for a fee. 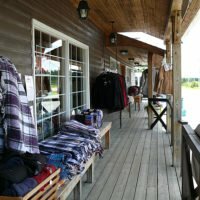 Teepee campouts, canoe heritage tours, and tea tours—the canoe heritage tour sparked my interest! And before heading on my way, I zipped across the road to Lillian’s Crafts and Museum of Porcupine Quill Baskets, home to the island’s largest and rarest collection of porcupine quill baskets. The small baskets start at $95.00 and, though tempting, my budget was better suited to a lovely handmade beaded bracelet! 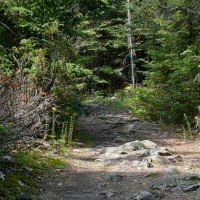 The day was passing quickly and before arriving in Little Current, I took a short detour to explore McLean’s Mountain, which boasts one of the island’s prettiest views. The turnoff from the main road was a bit tricky—it’s right in the middle at the apex of the fast corner you approach on. 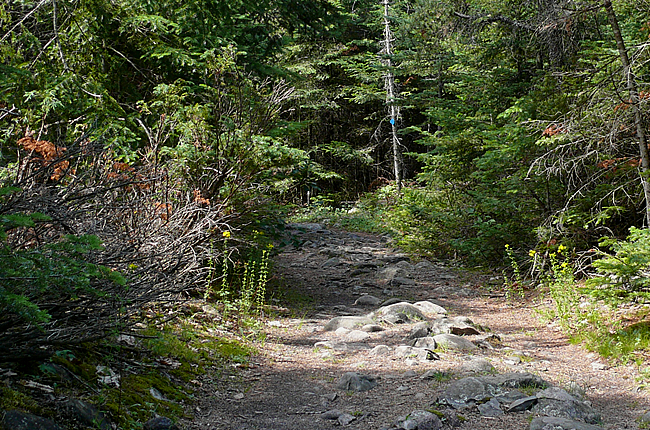 McLean’s road turns to gravel as it starts its steep climb, which is followed by a sharp corner. The BMW’s sport profile tires couldn’t find grip and spun round in the loose stones! I took it real slow and happily there was no traffic! 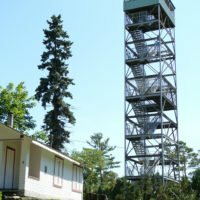 Once at the top, 328 metres (1,075 feet) above sea level, I took in the exquisite panoramic view of the area and could even see Little Current! I didn’t stay long as I couldn’t wait for the kick of riding through the gravel on the way back down! 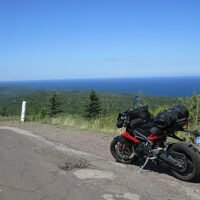 My night’s stay at Little Current’s Anchor Inn recharged me for another full day of riding! The Inn overlooks the waterfront marina and its owner Kelly (and husband Bruce) made me feel they’d known me forever! People are so friendly here in the North! Yesterday’s whitefish dinner still lingered on my tongue. Its accompanied veggies and herbs are right from Kelly’s garden! Trudy, Kelly’s mom, was also a rider so after we met for breakfast, she escorted me out of Little Current, timing the opening of the swing bridge just right. This is the only road which carries you across a narrow channel separating Manitoulin from the much smaller Goat Island. Farewell Gitchi Manitou! The ride north east on Highway 6 linked stretches of islands which peered over the lakes it crossed. 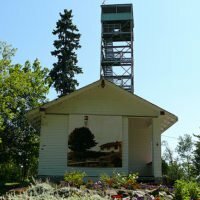 A few hours passed and soon the towering rock with its pine tree borders disappeared into the industrialized mining town of Sudbury. 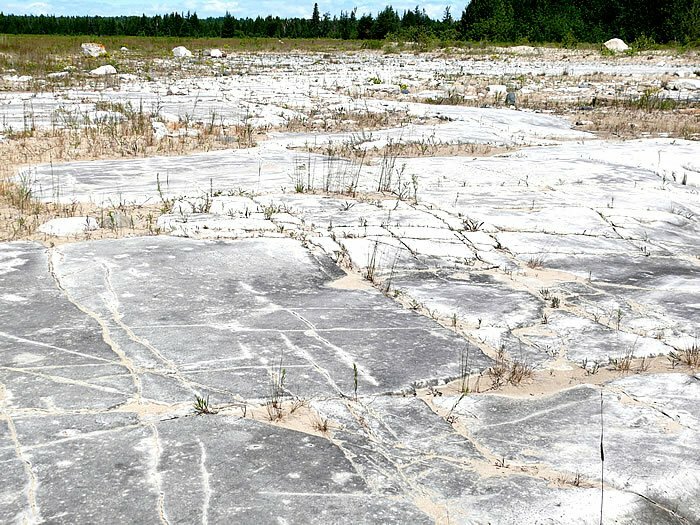 Easily spotted were the snowflake buildings of Science North—connected by a rock tunnel which passes through a billion-year-old geologic fault! This fault line was not known to be under the complex during the construction of the building. It was another “good sign” to the master plan of the science centre, geologist Franco exclaimed during my personal tour of the centre. I then rode over to the Big Nickel, now called Dynamic Earth, just in time to replace my helmet with that of a miner’s and be escorted underground for the Nickel mines’ last tour! 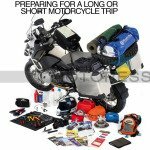 The final day of any motorcycle tour arrives too soon! South-bound on Trans-Canada Highway 69 are new sections of road whose pristine conditions beckon haste! I was happy to not miss the new wildlife overpass around the turn off to Killarney. The overpass is decorated with carvings of the animals it was designed to keep off this section of the highway, where a high number of collisions occur between vehicles and wildlife. 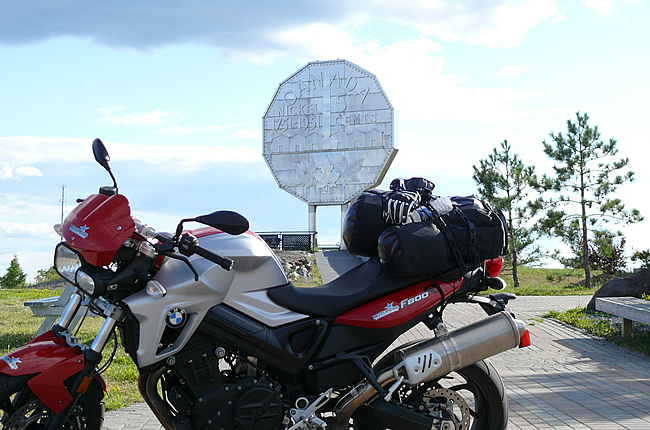 Another hour southward and I’d entered into French River region which marks the transition to the Canadian Shield. 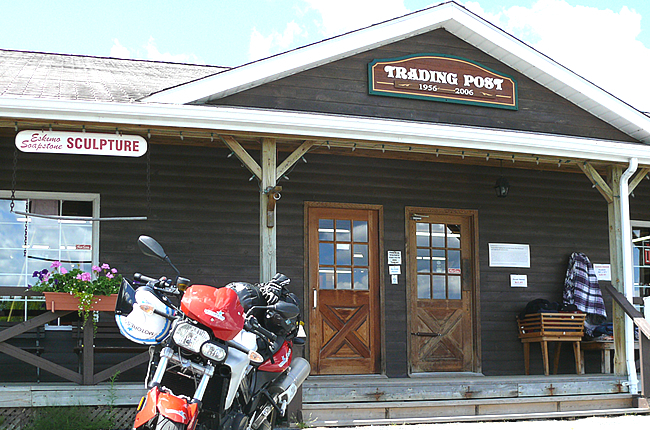 I pulled off to the roadside French River Trading Post—one of the oldest and largest gift shops in the region. Along with a superb selection of goods is a motel and a bakery with homemade fudge and “bear claw” cookies. 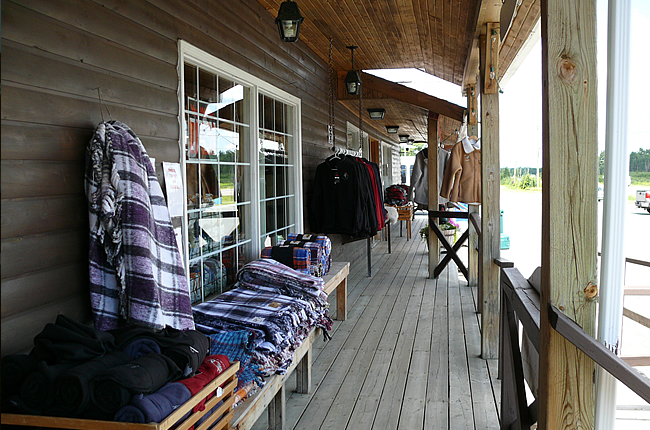 Then up the road at the next right, is the French River Visitors Centre, a must see! As described by its architects, it is itself “an expedition; through its sitting, organization, views and exhibition, and as a responsible construction in nature.” And as the sign states “brake for snakes,” you’ll want to keep an eye out for rattlesnakes! 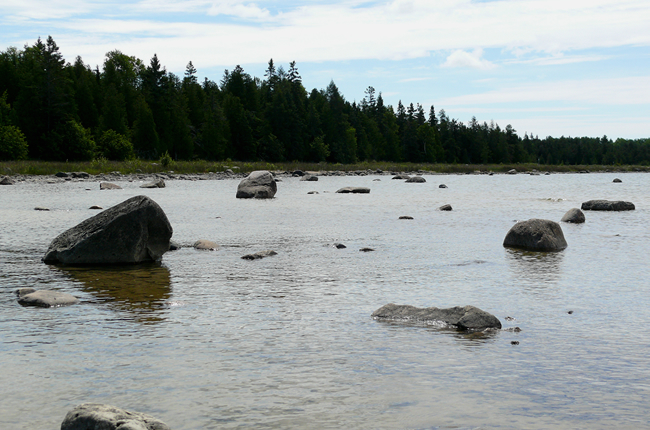 About 45 minutes further south from French River the 69 narrows. Its long broad turns disappear as it merges into the Trans Canada 400. 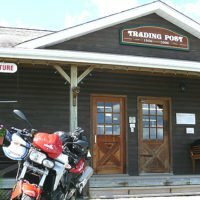 I turned into Parry Sound, home of the annual sport bike rally. 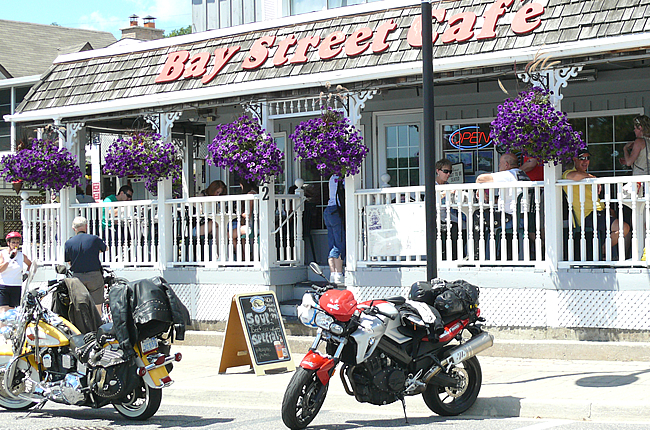 Lunch beckoned at the port side Bay Street Café, a favoured eatery of motorcyclists. The recommended local pickerel fish and chips were tasty! 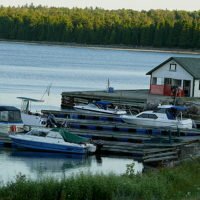 But it was the apple crisp dessert that topped this quaint waterside cafe’s fare! Back through town to Tower Hill Park & Garden, whose access road gives any rider a brief, twisty taste of rocky mountain riding! 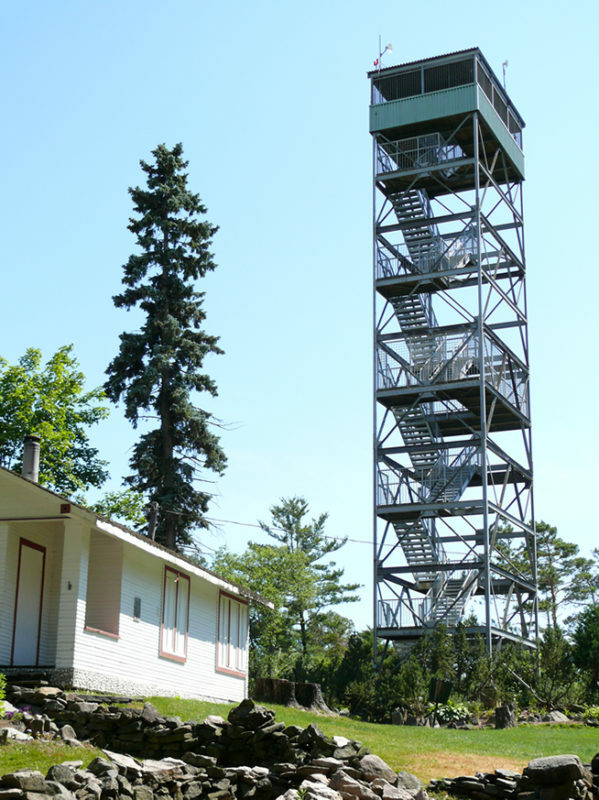 Atop lies the replacement Fire Tower of the 100-year old original—the “tower man’s” cabin still stands. There’s also a museum whose exhibits change throughout the year and groomed grounds free to explore or use as a picnic spot. I gazed from below to the top of the tower high above. I knew this stop wouldn’t be complete until I climbed its 131 steps to the 29 metre (96 ft.) look out—and I did need to work off the apple crisp! As much as I dilly-dallied about with my gear and cargo, I realized I couldn’t postpone my ride back to Toronto any longer. 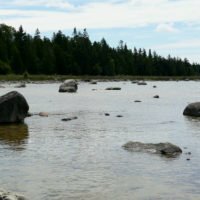 I’d grown fond of Georgian Bay. Its Great Spirit, its silent roads and its ancient riches—riding my own discoveries over an enduring terrain. 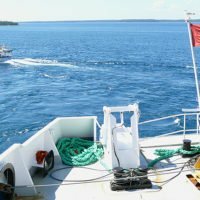 For information on the Georgian Bay Coastal Route & Tour, click here. 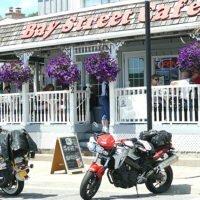 To plan your next motorcycle trip in Ontario, visit www.GoTourOntario.ca ►customizable itineraries & downloadable GPS files! 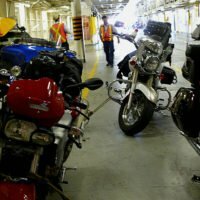 For more information on riding in Ontario, visit www.GoRideOntario.ca. 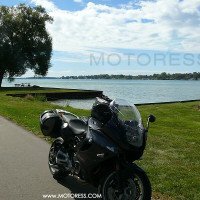 For a list of all motorcycle events and suggested routes to get there, visit Events.OntarioRides.ca.